Updating a policy in the Sametime System Console can be time consuming. I mean, changing the policy itself is quick, but waiting for the policy to be picked up by the Community server can take some time. I believe that the Media Manager policy is set to be spread out every 60 minutes?! One way I learned that can spead up this process, is by manually stopping the Windows service called "ST Policy" on the Community server!! Stopping this, and starting it again gives the Community Server a new and updated "policies.user.xml" and "policies.server.xml" file. Try it your selv. Nifty. 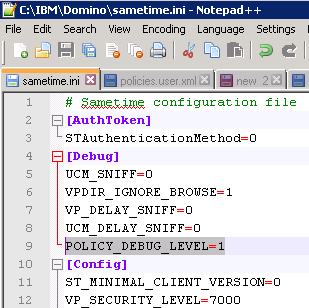 Editing the sametime.ini file, adding "POLICY_DEBUG_LEVEL=5" into the "Debug" section, and then restarting the "ST Policy" Windows service, gives you the trace files immediatly, without restarting the entire Domino server. Yeah, I tried that, but I couldn't the trace file output created after I set the trace setting in the stdebug tool. Weird. If anyone knows how to restart the "ST Policy" in a Linux environment, please share. Ok? The -HUP parameters will restart the stpolicy process?